When your theme snippets are installed for the pro tier, Product Customizer will display options prices on the cart, and at checkout. On the cart pages, option prices will be listed next to the option on the cart, and the total price for the line item is automatically changed to reflect the product price + customizations price. 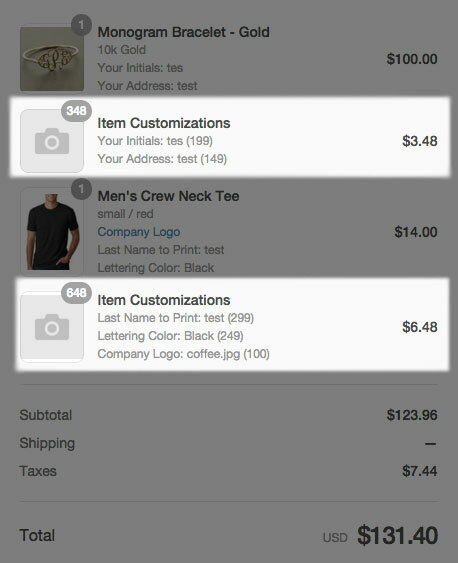 We use a hidden "Item customizations" product to add fees to your cart. Shopify does not provide any way to add fees or additional costs to a cart, so we need a product with a price to do this unfortunately. This item is set at $0.01 (or whatever your currency is) so that you can add any price for an option, and we just adjust the quantity (ie $5 = 500 of the $0.01 item). Otherwise we would need tons of these hidden products to add unique fees, which would clutter up your product management considerably. Our app's scripts hide this "fee" product throughout your product pages, collections, cart, etc to make it look like option costs are part of your regular product. However, on checkout, our app's scripts cannot run (unless you are a Shopify Plus enterprise merchant). This is because your checkout page is hosted by Shopify, not on your store's domain, and to be secure, Shopify doesn't not allow any third party scripts or code to run on this page. As a result, we cannot modify or "hide" the way your "Item Customizations" product is displayed as we can on your cart page. The customizations will be listed as a separate "product" with the total cost of the customizations separated from the product's base cost. Unfortunately, there is no way for us to change this from our app, as none of our code can run on your checkout page. We will always group item customizations with the product they're associated with, but this is as far as our modifications can go for the checkout page. If this changes in the future to allow external scripts, we will absolutely update our app to hide the "Item Customizations" product here as well, but it currently cannot be done. If you are using a Shopify Plus enterprise-level plan, please get in touch with our team, as we can gladly modify the checkout.liquid template for you. This would act comparably to our cart template modifications to hide the hidden pricing product.